The Community Health Association of Spokane is expanding services in Spokane Valley as it prepares for an influx of patients if the Affordable Care Act survives after the November elections. With a one-year, $100,000 grant from the Health Sciences and Services Authority of Spokane County, CHAS will open a new urgent care center somewhere near Valley Hospital early next year. They aren’t the only ones expanding in the area. Earlier this month Providence Health Care announced plans for a $58 million medical campus in the Valley. CHAS Medical Director William Lockwood said the urgent care center, along with the organization’s other urgent care facility in north Spokane, will differ from other medical offerings in the area. CHAS boasts eight other medical and dental clinics throughout the Inland Northwest, along with a school-based clinic at Sunset Elementary School in Airway Heights. Chief Operating Officer Aaron Wilson said it’s not uncommon for more than half of CHAS patients to be uninsured. For those with insurance, he said, urgent care is often a better option than an emergency room. That will be particularly apparent in 2014, he said, if the Affordable Care Act upheld by the Supreme Court this year remains in place. About 30 million people without insurance now will qualify for Medicaid, Wilson said, and the infrastructure to serve them is not in place. While paying customers are good for business, there wouldn’t be enough doctors to see all the patients who would be looking for medical help. “If the number of uninsured are now eligible to be covered by Medicaid, that obviously allows us to expand services,” Wilson said. Even with the future of the health care law unknown, Lockwood said, the Valley urgent care center will still fill a need in the area. “You can actually look at the demographics of patients who’ve been using our urgent care, and a large number of them come from the Valley,” Lockwood said, adding that many of them have a hard time making the trip to the other facility. The urgent care center advantages extend to the emergency departments as well, Lockwood said, as the state is pushing for patients not to go to costly emergency rooms for nonemergency cases. “The state doesn’t care that there’s nowhere for these people to go,” Lockwood said. “They just don’t want them to go to the ERs. The ER docs are stuck in the middle, knowing that there’s all this pressure from the hospital and the state to not see these non-emergent cases, and yet where else are they going to go? 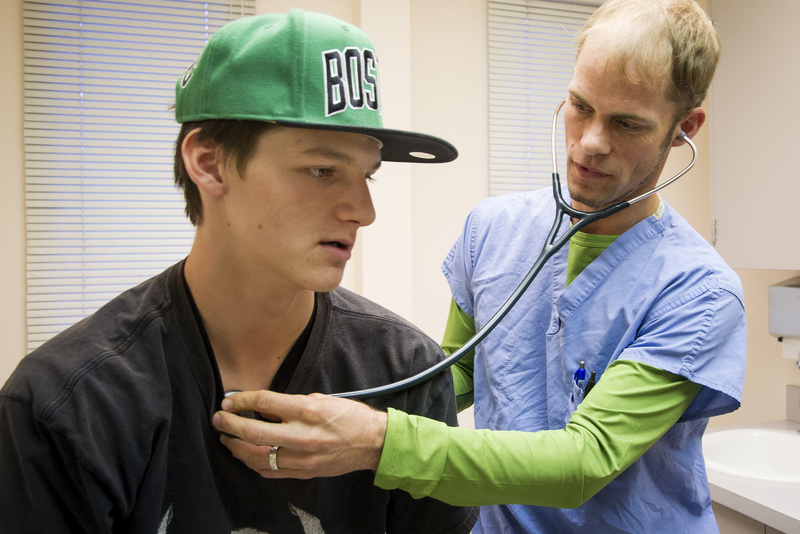 For Spokane resident Maria McLauchlin, the urgent care center saved her and her 16-year-old son a trip to their primary care doctor downtown or an emergency room. The two sought care at the North Side CHAS clinic Friday – McLauchlin with head congestion and her son with a cough. “When I’m sick, I come here because it’s convenient,” McLauchlin said. The facility, Spokane Urgent Care at 5901 N. Lidgerwood St., saw more than 13,000 patients in its first year after opening in 2011. As the number of people going to urgent care grows, CHAS administrators said they hope it will lead people to a primary care physician. Ethan Angell, a family-practice doctor who also works at Spokane Urgent Care, said there is often a lack of continuity of care when people use emergency facilities instead of primary doctors. That can change with more people becoming insured and medical providers expanding services, he said.